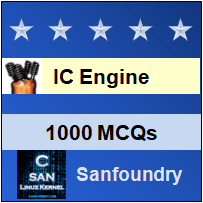 This set of IC Engines Multiple Choice Questions & Answers (MCQs) focuses on “Battery Ignition System”. 1. In battery ignition system, the energy required for producing spark is obtained from a _____________ battery. Explanation: The battery used in vehicles are between 6 V to 12 V, so in battery ignition system, the energy required for producing spark is obtained from a 6 V to 12 V battery. 5. The battery is charged by a __________ driven by the engine. Explanation: The battery is charged by a dynamo driven by the engine and shaft and axle are not used in a battery. 6. A lead acid battery consists of a number of cells connected together in series and each having a nominal potential of 2 volts when fully charged. 7. The lead acid battery is used in ______________ duty commercial vehicles. Explanation: The lead acid battery is used in light duty commercial vehicles while alkaline battery is used in heavy duty commercial vehicles. 8. The alkaline battery is used in ____________ duty commercial vehicles. Explanation: The alkaline battery is used in heavy duty commercial vehicles while the lead acid battery is used in light duty commercial vehicles. 9. Battery is connected to the primary winding of the ignition coil through an ignition switch and blast resistor. 10. The ignition system can be turned ON or OFF, with the help of ignition switch. 11. A blast resistor is provided in parallel with the primary winding to regulate the primary current. Explanation: In fact, a blast resistor is provided in series with the primary winding to regulate the primary current. 12. An eight cylinder engine running at 3000 rpm requires __________ spark per minute. 13. The function of the distributor is to distribute the ignition surges to the individual spark plug in the correct sequence and at the correct instants in time. 14. When the ignition switch is opened, the primary winding of the coil is connected to the positive terminal post of the storage battery. Explanation: When the ignition switch is closed, the primary winding of the coil is connected to the positive terminal post of the storage battery. 15. The primary voltage increases as the engine speed increases due to the limitations in the current switching capability of the breaker system. Explanation: In fact, the primary voltage decreases as the engine speed increases due to the limitations in the current switching capability of the breaker system.